How can we come towards one another, not with the aggression that alienates, but with the love that unites? There is no easy answer to this; a major part of prayer can be occupied in learning it. But one very practical thing helps: thanksgiving. Not humility—for which of us can claim to know anything about that?—but that cheerful, gracious act of being thankful Always there is something in every situation for which one can be thankful. The situation which contained all the tragedy in the world was one which was redeemed by thanksgiving: Jesus, in the same night in which he was betrayed, took bread and gave thanks. When we meet the betrayals and diminishments of daily life, which often turn our energies into sour aggression, it is possible in Christ to learn to take them and give thanks—not in any romantic or false way? When we ourselves betray and diminish others, we also have to turn that aggression into peace within ourselves. From my stall in the Chapel the East Window soars above drawing the eye into the detail and capturing the spiritual imagination. This is much helped by the changing time of prayer and seasons that shed light that opens up the colour and story. 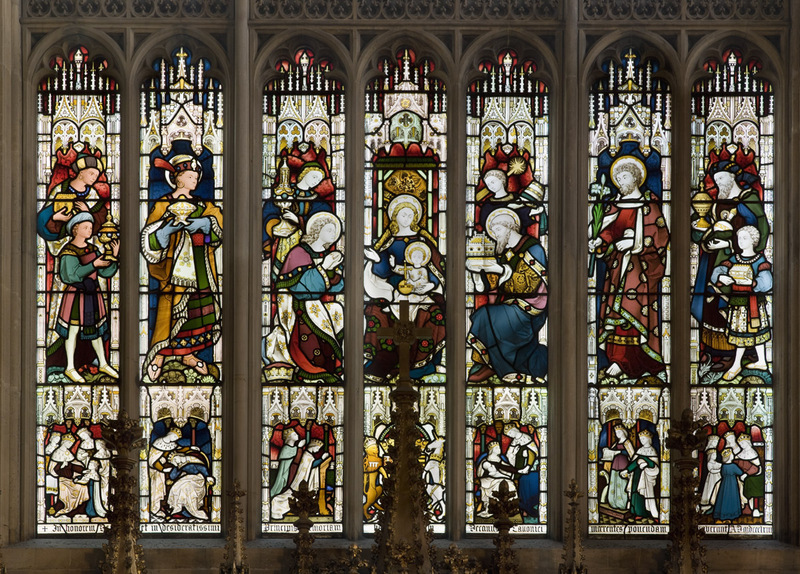 The window was designed as a memorial to Prince Albert in 1862-63.At the top of the arch of the window is Our Lord in Glory; the upper section pictures the Archangels; the centre the Resurrection and the lower (pictured here) the Adoration of the Kings. I wonder what strikes you about these details of the Nativity? The organisation, the design, drawing and painting are imaginative and skilled. The faces are delicate and the colours very fine. Beyond this the attention and focus on the Christ child captures the whole scene. The Kings offer their gifts. The attendants in their best robes look directly at this child. In their attention there is adoration too. They see in the Christ child something worthy of reverence and even worship. There is meaning and truth and purpose. This goes even deeper as they express this in the offering of themselves and their gifts. It is too easy to loose attention and take what is around us for granted amidst the activity and self-preoccupation of life. Next time look again at the detail and the story of this window and see in it a gentle draw into the love of God revealed in the birth of Jesus. This childCo has the power to draw us in: it invites us to question, yes, and also to worship and to wonder; to see and search for that which can set us free for grace and love. The Nativity shows the heart of love; the sheer awe and wonder of God’s life. It promises the joy, a deep and lasting joy, which comes from knowing that we are loved by God in Christ. how much more union can there be?